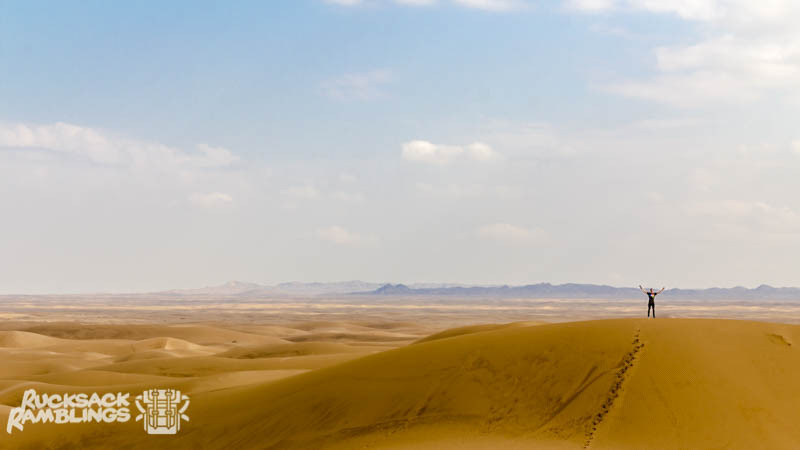 A Maranjab Desert tour is one of the best things to do in Kashan! Find everything you need to know about doing it independently right here. What do you get if you put a yellow city cab in the middle of an ocean of sand? That’s right, friends – a Maranjab Desert tour with a serious risk of getting bogged! If having to live the rest of your life amid the sand dunes a la Tom Hanks in Castaway doesn’t scare you, this is a pretty cool tour. And if it does scare you, just remember you can always make yourself a Wilson. Out of camel poo. Or… Yeah. Joking aside, this is one of the best things to do in Kashan. And for the budget backpackers like ourselves, here’s the extra good news: it’s easy to do independently. 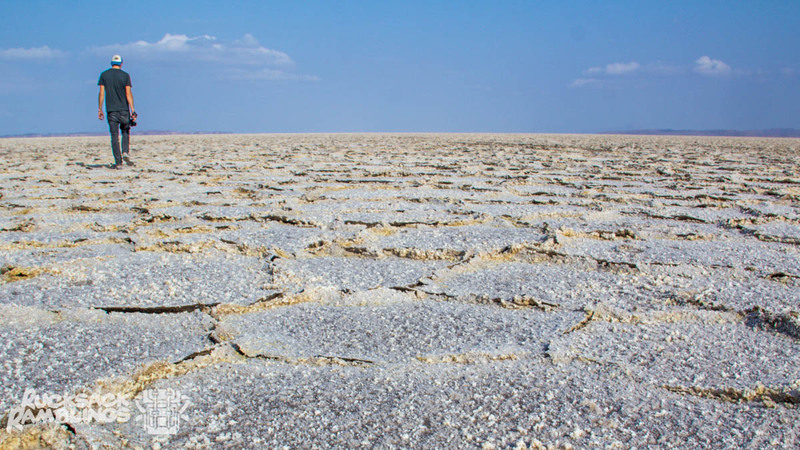 All you need is this post that tells you everything you need to know about a Maranjab Desert tour and bam – off you go! How much should the tour cost? Our cab was $21 and we split it between 4 people which is not bad at all. Most taxi drivers are open to negotiating their price, so put on your best smile and see where that takes you. How long does the tour take? The full tour takes 6-7 hours. We left at 10 am and got back at 4.30 pm. How much time is spent in the cab? You’ll cover a total of 150-ish km and a good chunk is on sand tracks in the desert. Expect to sit on your bum for 3.5-4 hours. Can I buy food on the way? Not really. Your best bet is to bring some fruit and flatbread from the bazaar for lunch. What should I consider when choosing a driver? Try to get an English-speaking driver. There’s not much information in English at the sites, so if you want to know about the history, your driver is your only hope. Make sure to insist on this point if you book your tour in advance – we got tricked. And if you do get a driver that doesn’t speak English, well, just remember all the lovely information in this post! Where can I find a driver? Avoid the taxi drivers that hang out at the bus stop you get off at when arriving in Kashan. They’re used to tourists and charge more than drivers in the city. There’s also a few recommended drivers in the Lonely Planet. How much will I pay in entry fees? You’ll pay about 250,000 rial ($8) in entry fees if you enter all the sites on the tour. Will I make lots of lovely camel friends? Yes! You’ll see these furry guys standing on the side of the sand track in the Maranjab desert. They’re quite friendly, but their table manners leave room for improvement. 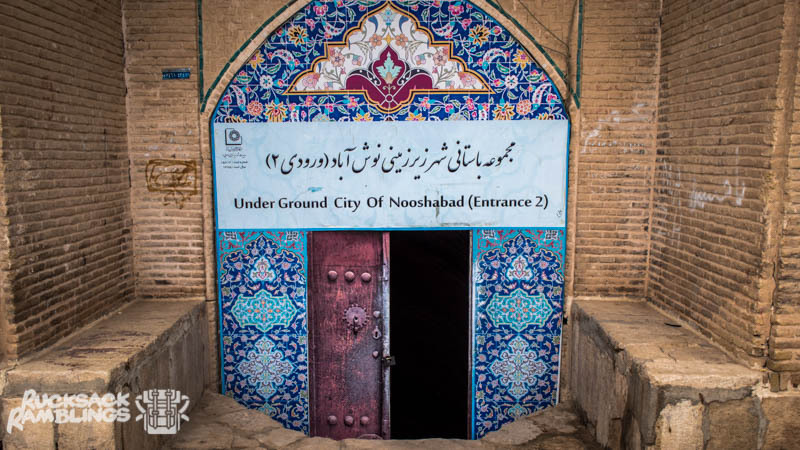 First up is the underground city of Nooshabad or Ouyi. It’s located 8 km north of Kashan and it is quite an engineering masterpiece. The fact that it was built 1500 years ago doesn’t make it any less impressive. The Nooshabad underground city was originally dug out around a freshwater spring. Its main purpose was to provide shelter from the merciless Persian sun. Over the centuries, people also spent prolonged amounts of time down there hiding from bad guys up above. Turns out claustrophobia wasn’t really a thing back then. Back in the day, there used to be all sorts of evil traps hidden in the narrow tunnels. Most of them should be deactivated by now, but you might just want to steer clear of any suspicious-looking flooring. Not sure travel insurance covers getting you out of an ancient underground pit. There’s a 200,000 rial ($6) entry fee and although you’ll be done in less than 15 minutes, it’s worth it. To be completely honest we don’t know a whole lot about this one. There’s a slight chance it might be Santa Claus’ holiday home, but we’re pretty sure something was lost in translation there. Alright, enough with the bad jokes. The second stop on the tour is the ruins of a typical clay fortress. It’s not in the best of shapes and many of the original decorative details have been lost. Unless your taxi driver moonlights as an archaeologist, you also won’t be able to find out much about the fortress’ history. There are no signs, not even in Farsi. On the bright side there’s also no entry fee. Oh, and by the way. There’s a schoolyard next door and if the kids in there spot you, good luck. They’ll be jumping up and down and waving like crazy for the next ten minutes. You’re expected to reciprocate so we suggest you bring a wristband and do some light pre-exercise stretching. One thing you’ll notice when backpacking in Iran is that these guys like to make shrines. This particular one is dedicated to Hilal ibn Ali who was the son of Ali who in turn was the cousin and son-in-law of the Prophet Muhammad. Did you have to read that twice to get it? Anyways. It’s one of the most picturesque shrines you’ll see in Iran and especially the colourful mosaics stand out. Those green and gold tiles look pretty fabulous against a clear, blue sky. And we’re only getting started. Inside, the actual tomb of Ali is decorated with elaborate golden details and bathed in this bright green light. 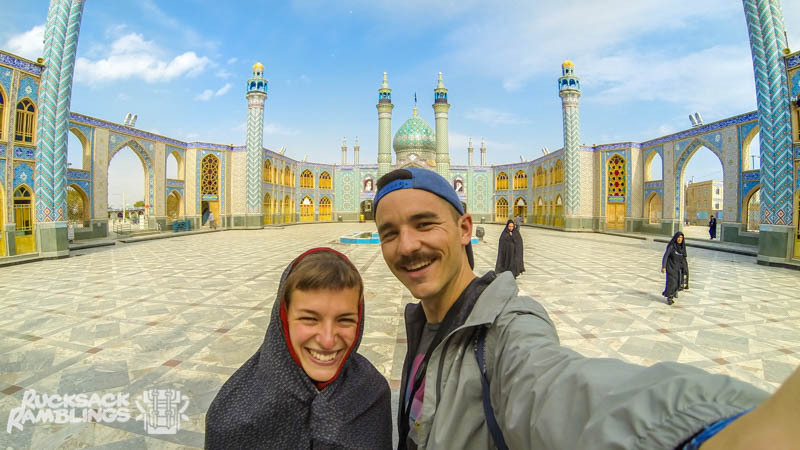 To make things even more fun, female backpackers get to throw on a fancy chador (don’t worry – you’ll get one at the entrance). If you’re wondering what the deal is with the tombstones out front, here’s the answer: they belong to martyrs from the Iran-Iraq war in the 1980s. If you’re interested in Iranian foreign politics, this war is a pretty good place to start. We know. Shocking. You actually visit the Maranjab Desert on a Maranjab Desert tour. Who would’ve guessed. The desert itself is pretty much a standard desert. You know, nice amount of sand dunes, a few wild camels here and there, and absolutely nothing but sand as far as the eye reaches. 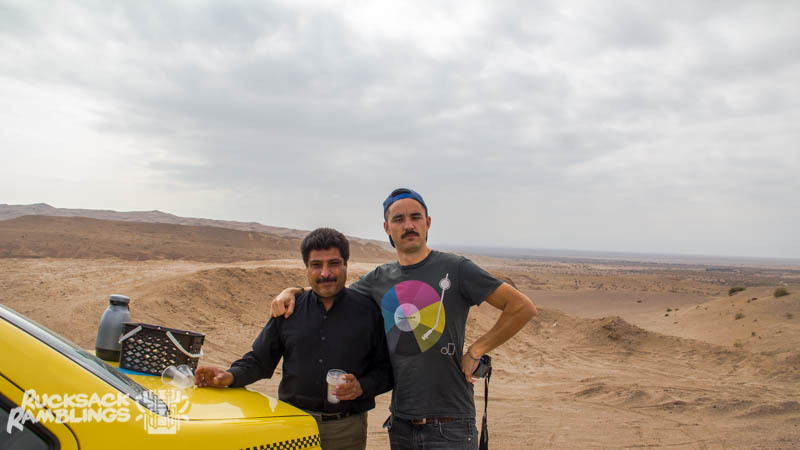 What makes a desert tour one of the best things to do in Kashan is actually just to be driving in a little yellow city cab in an ocean of sand. There’s a track to follow, so it’s not like you’re going full dune buggy, but one thing is for sure – those cabs are not built for off-road adventures. Apart from this, the main attraction in the Maranjab desert is the 400-year-old caravanserai. Back in the good old Silk Road days, the caravans travelling between Europe and China would pull in at this caravanserai. Sort of like an ancient highway motel, if you will. It sounds pretty cool, but in real life, it’s not worth the 50,000 rial ($1.5) entry fee. The place got a makeover a few years back and most of the original charm has been lost. When we say salt lake, what do you think of? The giant Uyuni salt flats in Bolivia? Okay, good. Now forget that. Kashan’s Dasht-e Kavir Salt Lake or Namak Lake (you got it – namak does mean salt in Farsi) is not quite as overwhelming as Uyuni. For one, it’s ten times smaller. Having said that, it’s still a beautiful place that has everything a salt lake is supposed to have. So, yeah, mainly just salt. The only thing that can go wrong here is if you visit after it’s been raining. If that’s the case, you’ll be looking at a lovely mud lake like we did in some places. Iran gets most of its rain between November and March, so if you’re into salt lakes, you might want to plan around that. If not, well, you’ll probably be fine. That’s it, guys. 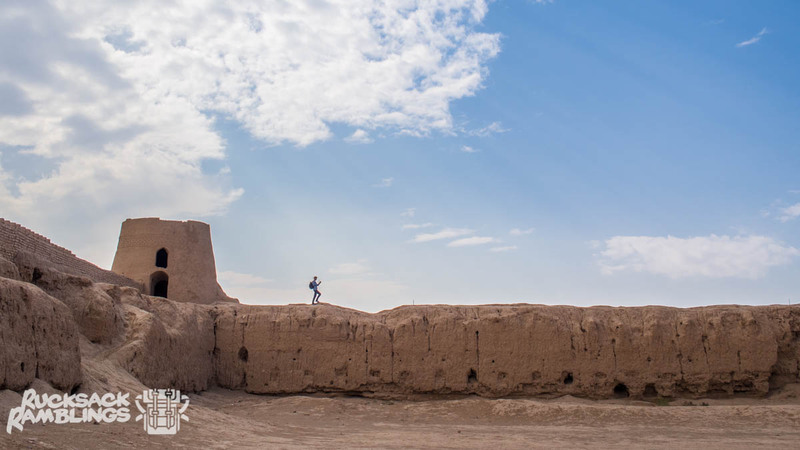 You now know everything there is to know about a Maranjab Desert tour from Kashan. All you need to do is get yourself in a cab and get out there! Do you have any cool suggestions for other things to do in Kashan? Or do you just want to say hola? Drop us a line – we love making new friends! Thank you for sharing you travel experience. I find it really helpful. Im planning to visit Iran soon. May I know the cab fare $21 to Maranjab Desert, Kashan, Iran is it return or one way?